More pictures of R/C Komets, kindly supplied by Bob Chubb. The Komet model built by Sal Calvagna (from Holbrook, NY) is an 82" wing span model, built using Jim Kiehl plans. It was built in 1994 and took 4 months to complete. The wings are balsa sheeted about 40 percent chord and then finished with Solartex film. All four control surfaces act as elevons. Sal's Komet is powered by a Magnum 1.08 engine. It has a 16 ounce fuel tank. A Futaba Super 7 radio and standard servos are fitted. Sal finished his model with commercial grade flat camo paint. The flight ready aircraft weighs in at 11 pounds. The Komet is very responsive with the elevons. 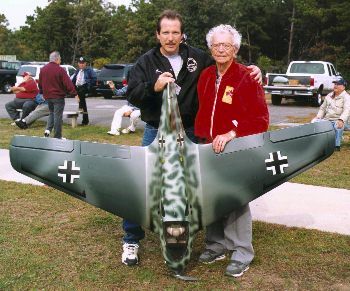 Builder Sal Calvagna got acquainted with famous WW2 Komet test pilot Rudolph (Rudy) Opitz, and invited him to come over and enjoy some model flying. 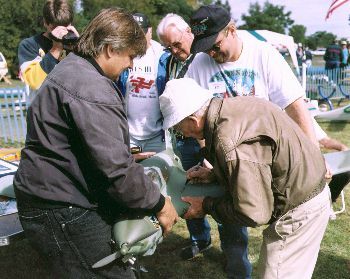 The result can be seen here, with Rudy Opitz putting his autograph on the root of Sal's Komet. 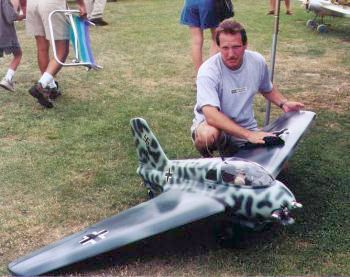 The Komet builder and Komet pilot posing with the model. This meeting also led to an article called Sal's dream published in Model Aviation. 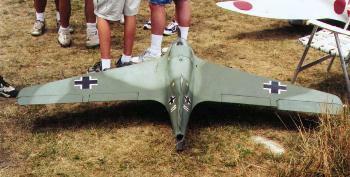 Sal is now planning to build a 120" (305 cm) wing span Komet, which would make it 1/3 scale! Kevin Shaw (from Middle Island, NY) built a Komet model with an 82" wing span built from Jim Kiehl plans. The wings and fuselage are sheeted 100 percent with 3/32" balsa, filled with micro-balloons where needed, and covered with 1 ounce per yard fiberglass cloth. It took 9 months building time. It is powered by a Magnum XL-108A engine and a 16 ounce fuel tank. The flight ready aircraft weighs in at 14 pounds. Kevin has also installed a 1 1/2" solid rocket fuel tube into the rear of his komet for rocket take-off but needs to obtain a special permit in order to purchase the larger size engine which he would need for takeoff. Kevin took jars of Testors RLM camo paint to the local hardware store and they matched it for him (Latex house paint). He finished with a fuel proof flat clear (Cheveron Polyurethane). 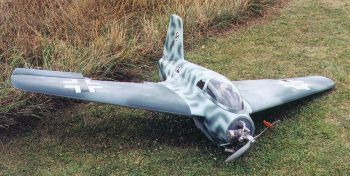 The camouflage pattern is one of the most attractive Komet schemes: solid colored wings, and a light colored fuselage covered with small mottles. The base coat was RLM 76 light grey-blue, with RLM 74 and 75 dark greys for the wings and mottles. 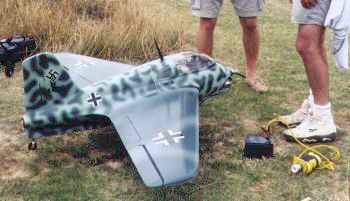 Kevin's model has a scale-like starting dolly fitted under his Komet. 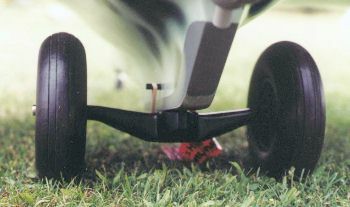 During take-off the dolly is only attached by two steel pins with a loose fit. Upon take-off the dolly falls off. It works rather well. 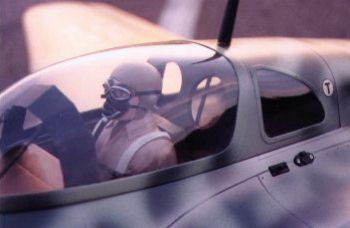 This close-up of the cockpit shows the quality of the finish and the attention to detail of this model. Kevin is planning to fly his model with rocket propulsion, but he hasn't been given a permit yet to use the rocket engine he needs. 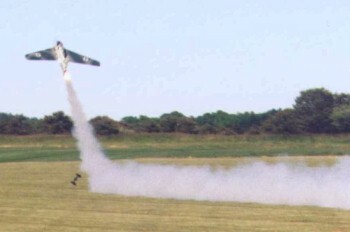 The engine run shown here uses a much smaller rocket engine that does not have sufficient thrust to fly the model. But it surely looks nice! 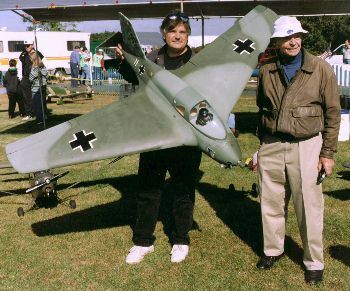 Kevin also met with former test pilot Rudolph Opitz, who regularly comes to enjoy some RC flying. His Komet now bears Opitz' signature too. 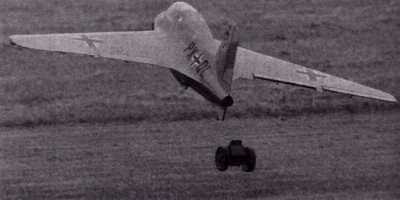 Kevin's Komet taking off under combined rocket and prop thrust. From here it looks really spectacular! Note the dolly dropping away. Rich Zwirblis (from Ronkonkoma, NY) also built an 82" wing span model, built using Jim Kiehl plans. Rich modified the plans, so the model has removable wings and flaps (spoilers) under the wing like the real one. You can see them peeking from under the wing in the picture below. The wings and fuselage are sheeted 100 percent with 3/32" balsa and then finished with a Solartex film covering. A two stroke MVV 1.20 engine is installed. 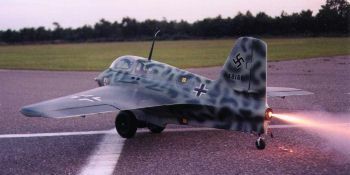 The camouflage is almost similar to that of Kevin's, and that's because Kevin painted both aircraft at the same time. Rich's model has the wing roots mottled too, something seen on real Komets too. It took one year to complete the model, working off and on. During 'Warbirds over New Jersey' on 25 September 1999, three 1/4.5 scale Komet came together and this group photo was taken. It shows from left to right Kevin Shaw's, Bob Chubbs's and Rich Zwirlblis' models. Lastly, a picture of the same model finished Joe Saitta (the kit producer) in action. The release of the start dolly looks very realistic!